Pictured are Union City Lions Club President Joe Wyant and Darby Livingston from Tree Hill Farms in Union City, Indiana. UNION CITY, Ind. 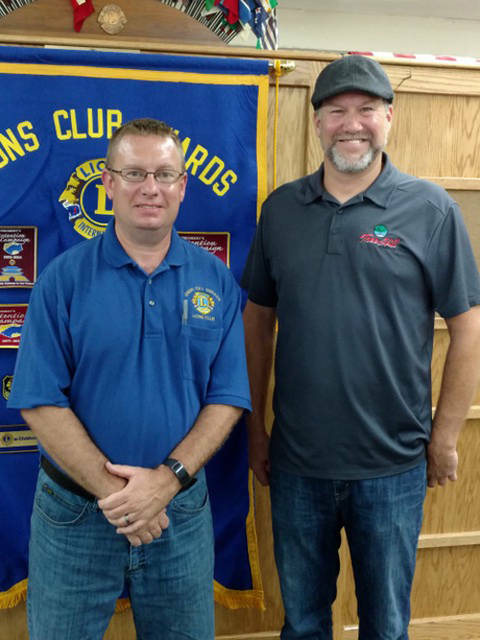 – The Union City Lions Club held the first meeting of the 2018-19 Lions Year on Sept. 11. A meal served by D’s Restaurant in Union City, Indiana, was enjoyed by the members and three guests. After the meal, Mike Grim and Larry Carpenter shared some information about a golf scramble being held in honor of Bob Gard. Gard worked for 21 years at the Winchester Golf Club and was a Union City Lions Club member for many years. The golf outing will be at 1 p.m. Sept. 29 at the Winchester Golf Club. Proceeds from the outing will go to the Journey Home in Winchester and to the Union City Lions Club. Tree Hill Farms produces vegetables and meats that are chemical, antibiotic and hormone free. Its products include many types of produce and meats including pork, beef, chicken, even ducks, geese and eggs. Tree Hill Farms wants to become the local “one-stop shop for real food.” The goal of Tree Hill is real food made simple. Livingston told the Lions that Tree Hill Farms has purchased the old Pit Stop Grill building in Union City. Tree Hill Farms wants to use the facility as a kitchen to process its food and to hold farm to table events. It does not have plans to open it as a restaurant but would like to bring in guest chefs to prepare meals and to have teaching events that deal with food preparation. Anyone who is interested in food from Tree Hill Farms can access information on the business’ website. It has pick-up locations around the area or will deliver to customers’ doors for a $9 delivery charge. Tree Hill Farms’ web address is https://treehillfarms.com/.